SKU: B1100. Categories: Bedroom, Crown Mark. Tag: BedB1. 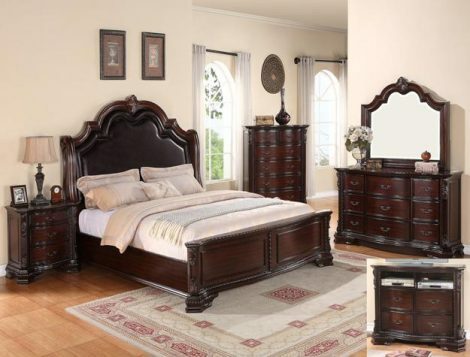 The Sheffield collection brings you traditional bedroom furniture with beautiful details and plenty of storage options. Use a chest of drawer or dresser to hold folded clothing, bedding and more in your bedroom. Pair a mirror and a dresser together to create a piece that is functional and stylish. 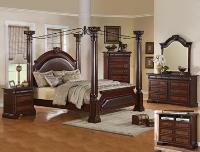 The panel beds feature an upholstered headboard as well as dramatic nailhead trim. Bracket feet full of carved details are used on pieces throughout the collection as well as leaf like carved details. Transform your master bedroom suite with this traditional style bedroom collection. Available King or Queen Size beds.